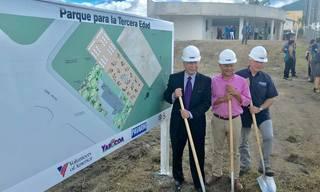 Volunteers of America National President Mike King gave the opening remarks at the groundbreaking of Parque para la Tercera Edad in Yabucoa, Puerto Rico. After the damage done by Hurricane Maria, the Puerto Rican people attending the event were thrilled to receive news of some restoration to their beautiful island. Parque para la Tercera Edad, a community-oriented park and senior center, will be the first major development in the city since Hurricane Maria. This community-oriented park will reflect the area’s agricultural heritage and will be a place for community gatherings, for educational opportunities, and for community gardening. A beautiful new pavilion will provide for a variety of uses, including an open-air classroom and an accessible senior area. In fact, the entire park will be designed to allow easy access for seniors and others with different levels of mobility. 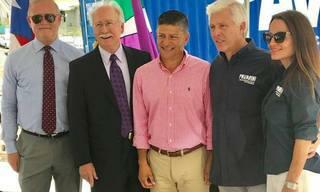 The open-air classroom will encourage learning partnerships with organizations like the local public library and the University of Puerto Rico Agricultural College. Behind the pavilion, the new urban gardening area will allow for a communal garden, or it can be divided into plots to be tended individually by community residents. 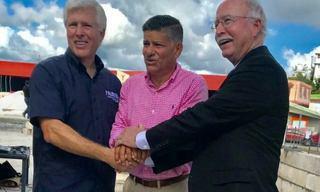 “Volunteers of America is committed to seeing Puerto Rico thrive,” said King, “And we are proud to play even a small part in helping the Puerto Rican people get back to their lives before the devastation caused by Hurricane Maria.”. 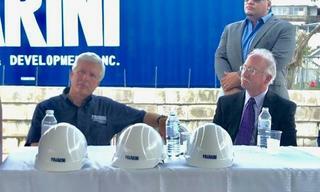 Pavarini Construction and Development, Inc. In an effort to help the people of Puerto Rico recover from the devastation of Hurricanes Irma and Maria, Volunteers of America staff members from around the country are traveling in shifts to the island to stay for approximately one week to organize and distribute water and other supplies donated by generous supporters.